SO, WHO WAS John Devitt Stringfellow Pendlebury? 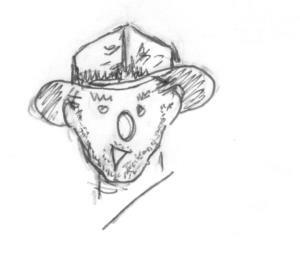 He was a bit of a character. He was born in 1904 and started off life – well, from the age of two – with only one eye, having lost the other in an accident, the cause of which was never established for sure. He was quite an athlete, gaining an athletic blue at Pembroke College, Cambridge in 1926/7. He completed for selection in the 1924 Olympics, the setting for the film, Chariots of Fire. He was also an academic, gaining a Second and a First for Parts I and II respectively of the Classics Tripos at Pembroke. 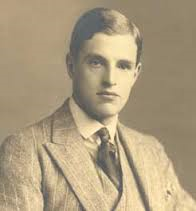 He went to school at Winchester College and, whilst on a school trip to Mycenae (in Greece – you remember) in 1923, he became interested in archaeology. After leaving university in 1923, he worked at the British School at Athens studying Egyptian artefacts found in Greece ( he couldn’t make up his mind whether to study Egyptian or Greek archaeology so he combined them both!). At the school, he met Hilda White, his wife-to-be (she was 13 years his senior). 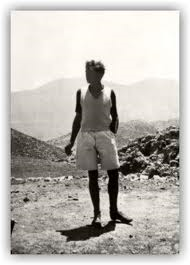 He first visited Knossos (Crete – keep up) in 1928 and his initial reaction was that Arthur Evans’ restorations had spoiled the place (you’ll have to back several blogs for that). After that he went, with Hilda, on his first excavation at an ancient Macedonian site at Salonica under Walter Heurtley (Alexander the Great was Macedonian, but you knew that). Pendlebury married Hilda shortly afterwards. 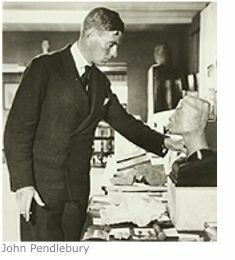 Evans had been impressed with what he had heard of Pendlebury and, in 1929, offered him the curatorship of Knossos on the retirement (forced due to illness) of the then present curator, Duncan MacKenzie. The job began in Spring 1930 but the place was in a bit of a mess when he took over – buildings in disrepair, animals grazing amongst the ruins and the site littered with rubbish from visiting dignitaries (it wasn’t open to the public yet). Pendlebury put in a great deal of work reorganising the place as well as refurbishing the Taverna (accommodation building not a bar) where Hilda and he resided. 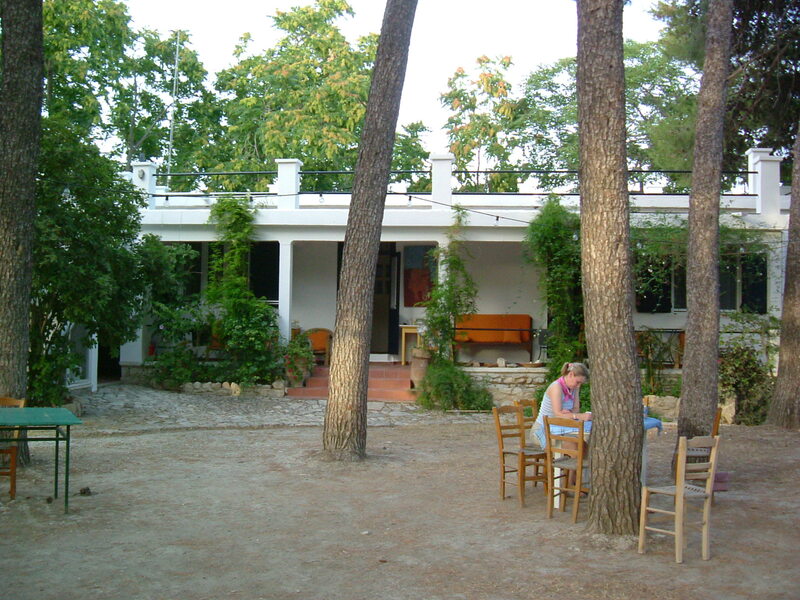 The Taverna is next to Villa Ariadne where Evans lived. The curator still lives at the Taverna today but it’s also now used for students. 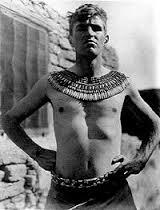 Later in 1930, Pendlebury was offered directorship of the Tel el-Armana excavations in Egypt. This he could not turn down and was able to carry out this task along with the curatorship at Knossos (climate differences meant excavating in Egypt in winter and Knossos in spring). He continued at Armana until 1936 (click here for great video of him at Armana). Back in Knossos (1932) he had the arduous task of recording some 2000 sherds with the help of Hilda and two other ‘up-and-coming’ female archaeologists, Edith Eccles and Mercy Money-Coutts. In 1933, he produced his Knossos guide book, A Handbook to the Palace of Minos at Knossos, and was now seeing Evans’ reasons for the restorations – he put in the preface of his guide book, “Without restoration the Palace would be a meaningless heap of ruins, the more so because the gypsum stone, of which most of the paving slabs as well as the column-bases and door-jambs are made, melts like sugar under the action of rain, and would eventually disappear completely.” So that’s the answer to the critics who are still anti-Evans-restorations. But we won’t go there. 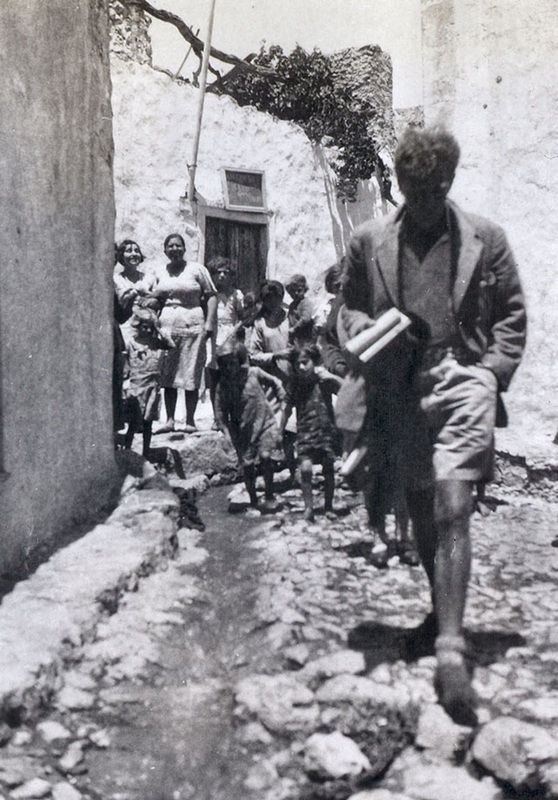 Anyway, he continued as curator at Knossos until 1934 but spent some time travelling the island as a freelance archaeologist researching for his very comprehensive book on the whole (then known) archaeology of Crete published in 1939. Then came the war. Pendlebury returned to England to convince the authorities that Crete was a strategic position and had to be defended. He offered his services to return to the island to prepare for a German invasion. 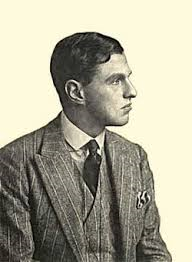 In May 1940, he was sent back supposedly as British vice-consul at Heraklion (then still known as Candia) but the title was just a cover and – as with Lawrence of Arabia – he was a spy! He began planning and liaising with the local Cretan clan chiefs ready for the anticipated invasion which duly came on 20th May 1941. 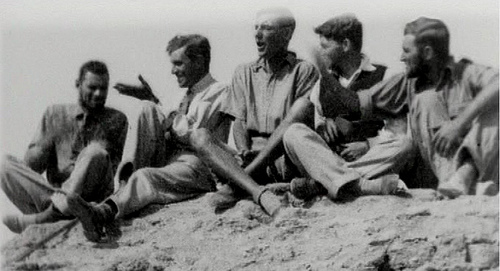 Patrick Leigh Fermor, was also ‘stationed’ in Crete (he was the leader of the kidnapping of the German general, Heinrich Kreipe, from the island – see ‘next week’) and he said of Pendlebury, “I was enormously impressed by that splendid figure, with a rifle slung like a Cretan mountaineer’s, a cartridge belt round his middle, and armed with a leather-covered swordstick.” Pendlebury was based in Heraklion and if ever he left his office for a short time, he would leave his false eye on his desk to let people know he wouldn’t be long! The Germans parachutists took a bit of a hammering on the first day of the invasion. They were somewhat surprised at the Cretan and British (and New Zealand and Australian) defence. On the second day, 21st May, Stukas were bombing the island and parachutists still coming in. Pendlebury had left Heraklion, then got out of his car and approached an area where German parachutists were coming in. He was then wounded in the chest, whether by a parachutist or Stuka machine gun fire is not known. He was taken by German parachutists to the house of his friend, George Droussoulaki (who was fighting elsewhere and was killed later that day). George’s wife, Aristea, reported that Pendlebury had his wounds attended to by a German doctor and, in the evening, was attended again by a German doctor and given an injection. He was told by the doctor he would be collected the next day and taken to a hospital. The next day a different group of German soldiers appeared and dragged him out of the house, propped him up against the wall and shot him. Why he was shot is not clear. It may have been that the Germans knew who he was and decided this the best cause of action. Or they thought he was spy being British but dressed as a local Cretan (well, I suppose he was). Or they were just especially evil. 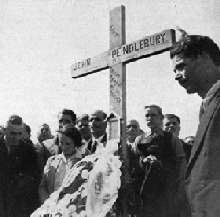 He was initially buried where he had been killed but because it became a shrine to the Cretan Resistance it was moved by the Germans to the Rethymnon road where they could keep an eye on it. 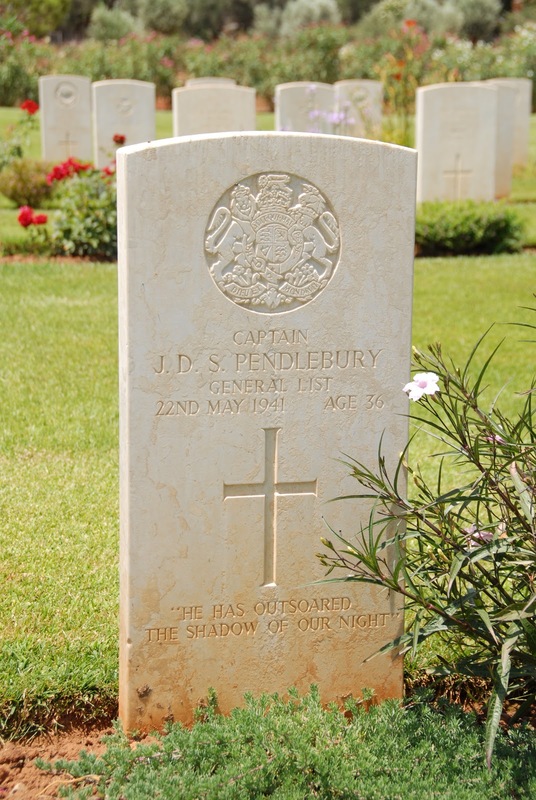 He was later reburied in the British war cemetery at Souda Bay (on the west of the island). 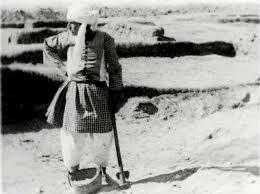 One wonders what he may have achieved had he survived and (a) continued as a Resistance leader during the war and (b) as an archaeologist after the conflict. A great loss of a great man. The only book I know that has been written about JP is Imogen Grundon’s A Rash Adventurer: A Life of John Pendlebury, Libri, 2007. It’s a good read. 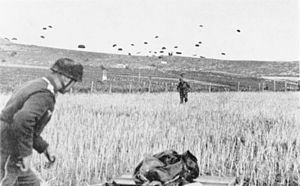 The Germans lost around 3700 elite parachutists (plus some 1600 wounded) in the first four days of the invasion of Crete. That was more German soldiers killed than in the whole war up to that date. They never attempted another parachute invasion of anywhere again. Next week: Let’s stay in Crete but back to films – Ill Met by Moonlight: ‘Hollywood’ fact or fiction? – okay, a British, not a Hollywood, film, but let’s not nitpick – the tale of the kidnapping of General Kreipe from Crete in 1944. My dear friend Randolph Bollinger-Smythe died last week of a heart attack whilst excavating in the Himalayas. He was 89. He lived by the dictum that moderate drinkers live longer – and it damn well served them right! ← Wild Bill [Hickok]: Hollywood fact or fiction? My name is Francesca Pendlebury and John D Pendlebury was my grandfather sadly I never met him but when I was small I used to stay with my grandmother Hilda nee White .She was a wonderful lady full of life and lot’s of stories .I agree with you it’s so sad he died so young because I am sure he would have done so much more . Hi Francesca, It’s great to hear from you. Your grandfather was certainly a formidable fellow and I would have loved to have heard your grandmother’s stories! From what I have read about her, she, in her own right, sounds like she was a fabulous character. Whenever I’m in Crete and about to make my way up a steep hill in some Cretan wilderness, I always use your Grandfather’s phrase and say to my wife (despite her name being Sarah) “Strike forth Hilda”! !